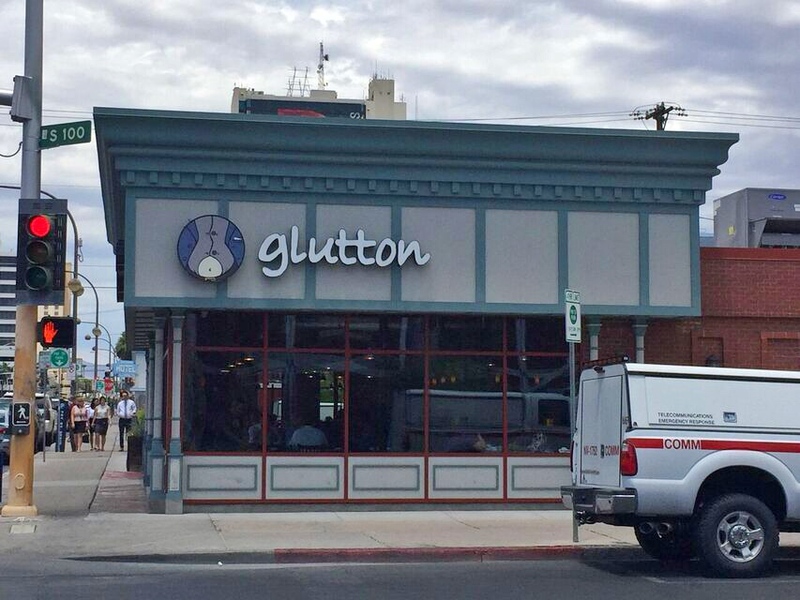 There’s a little spot in the middle of Sin City, next door to a restaurant called Glutton, 2 blocks from the intemperate stretch of road that is the Fremont Street Experience, and around the corner from the shameful Heart Attack Grill, that only serves vegan food. 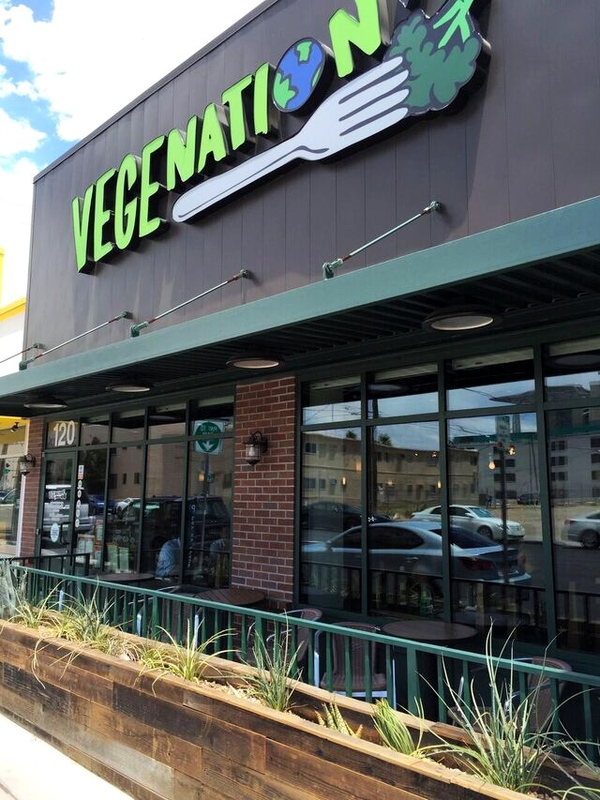 On a recent trip to Las Vegas I was drawn to Vegenation like a moth to a flame. Like an ant to a picnic. Like a dietitian to a plate of quinoa pilaf. In a town known for its extravagant buffets and ever-flowing alcohol, I was slaphappy to have a whole entire 3-page menu of healthy food to choose from. I took all three travel buddies with me for lunch: the husband, the sister, and the niece. We were seated right away, and our waitress, Nikki, was incredibly sweet. Turns out she’s from Washington state, so we had a lovely chat getting acquainted. 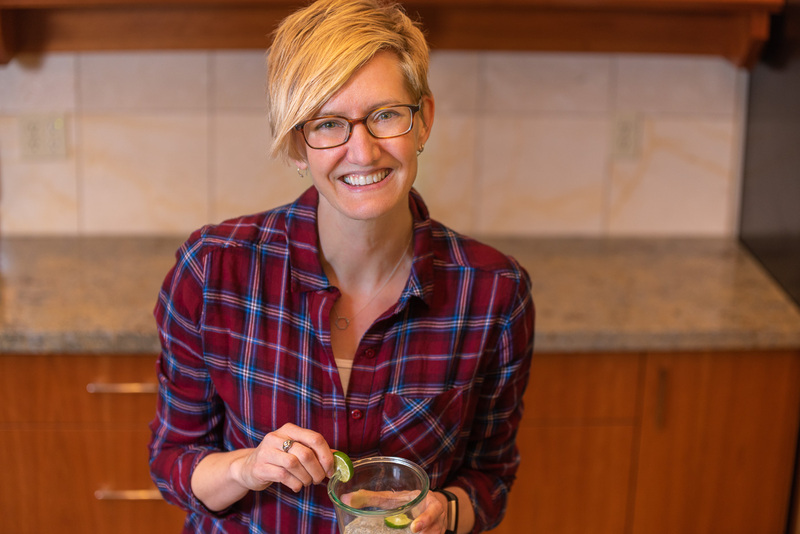 When I put on my high-maintenance blogger hat and asked a million questions about ingredients, she explained the answer kindly or double-checked with kitchen first. She also explained that any menu item with chicken or fish was actually made with Gardein meat substitutes. Enough with the pleasantries, let’s talk about the food. 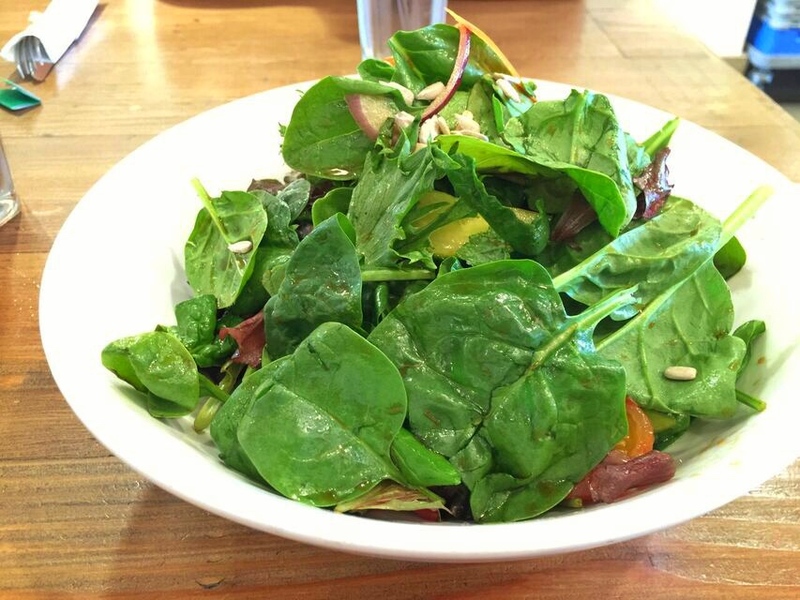 I started with the Power Haus Salad. Let me tell you, it was piled high with a nice mix of local greens and veggies, and was all shiny from the soy ginger dressing. 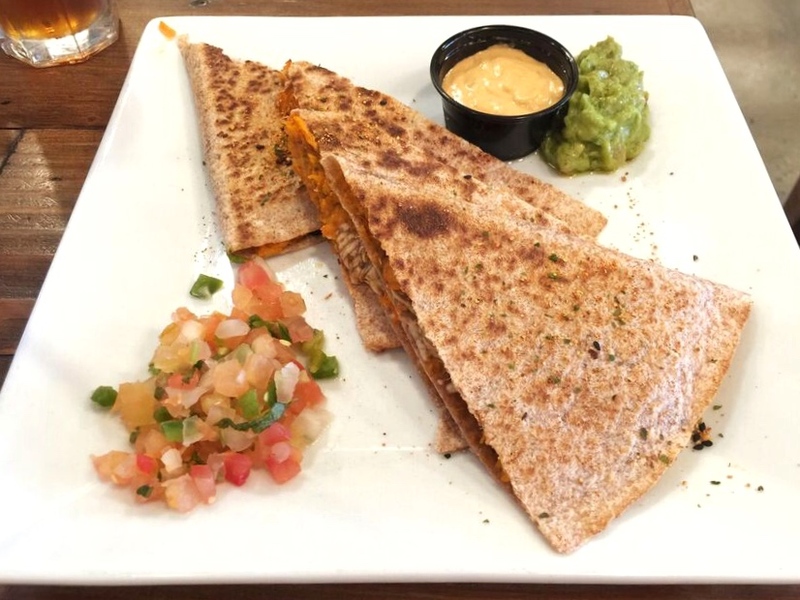 My salad paired nicely with my Muchas Gracias, an organic sweet potato quesadilla with black beans, non-dairy cheese, and chipotle crema (which I got on the side). If you look closely at the picture, you can see there is some type of seasoning salt on top which was a very tasty addition to the already good blend of flavors. It was served with a beautiful but fiery salsa. For beverages, I had the Mango Ceylon iced tea, with free refills no less. 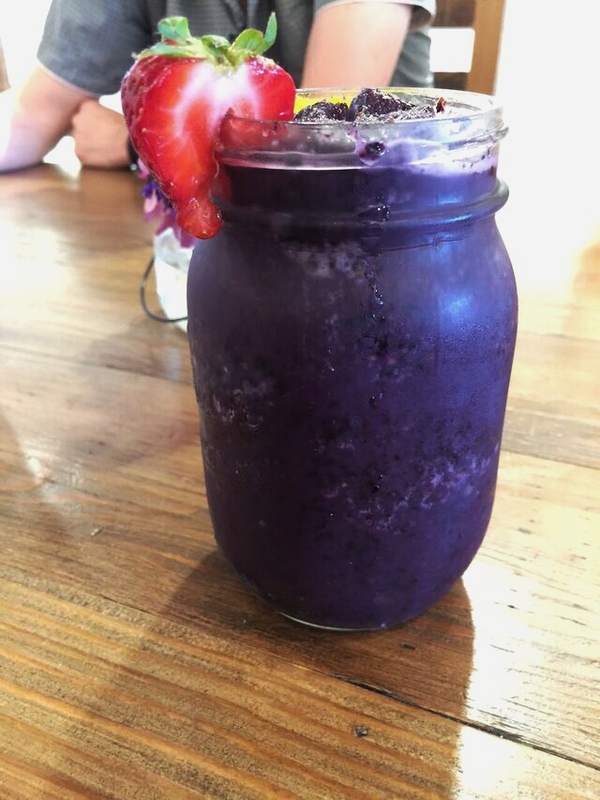 The niece ordered the Berry Blast smoothie and rated it highly: blueberry, strawberry, raspberry, mint, and spinach. 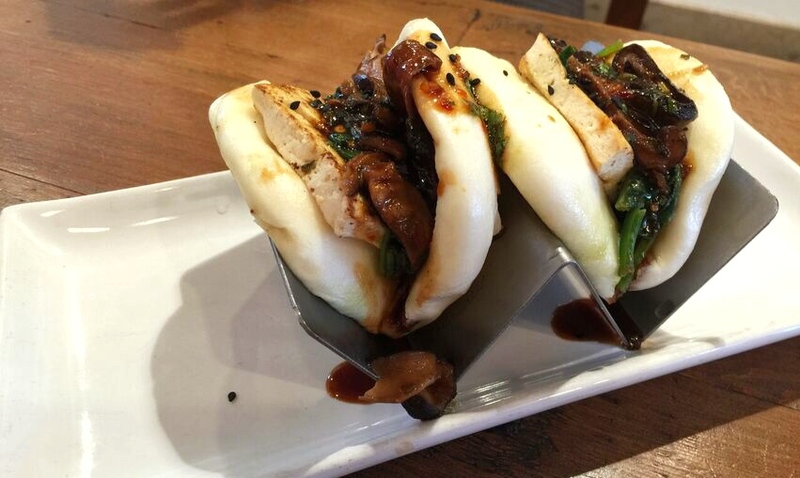 The husband ordered the Bao Wow appetizer: Asian BBQ tofu, spinach, and shiitake mushrooms in a doughy bun. He thought they were very reminiscent of traditional hom bao, and they definitely get cool points for presentation in their little W-shaped dish. His main dish was the daily special: fish tacos. He really liked the sauce and breading on the fish, describing it as crunchy but not super oily. While it was hard to say it tasted like fish, it served its purpose. He noted it was flavorful and “just something tasty and deep-fried in my taco”. 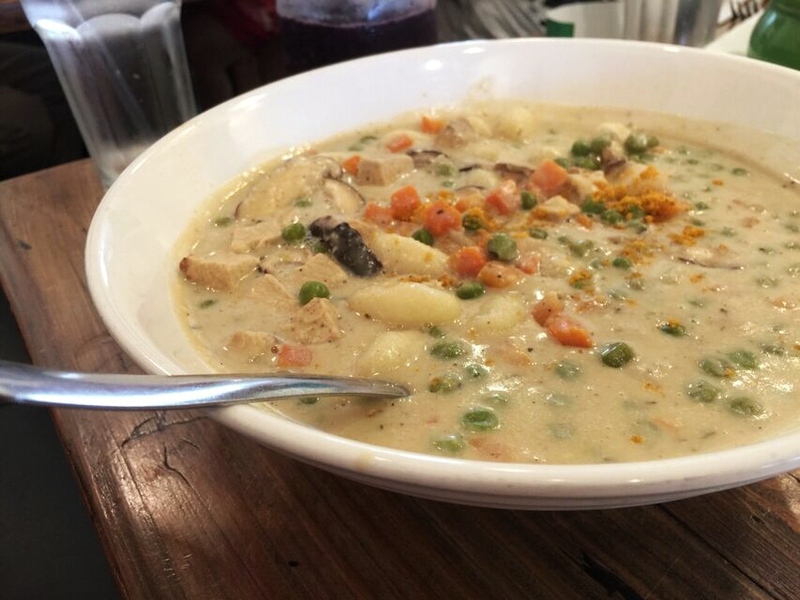 The teenage niece, who is not vegan, braved the Chicken Pot Pie Gnocchi. Let me just say it was a huge portion of chicken, homemade cream sauce, peas, mushrooms, and gnocchi with a local herb blend. She was satisfied, but only ate about a third of the massive bowl. The sister had the Mexican Hummus from the Starter menu: chipotle lime black bean hummus with organic corn chips. She said it was tasty and not too spicy; her only suggestion was that it would have been nice warmed up. Since I rarely get the chance to order fancy vegan desserts, I ordered two, for us all to share. First, the Blueberry Cheese Cake. This is one of the items I had to pester Nikki about because I wanted to know how they made it. The crust is almonds, walnuts, dates, and cinnamon; the filling is a blend of cashews, coconut oil, and lemon juice; and it’s all smothered in an organic blueberry sauce. The combination of the crumbly crust, firm but smooth middle, and sweet topping with bursting berries was so enjoyable. But the whole table agreed the Brownie Sundae was da bomb. 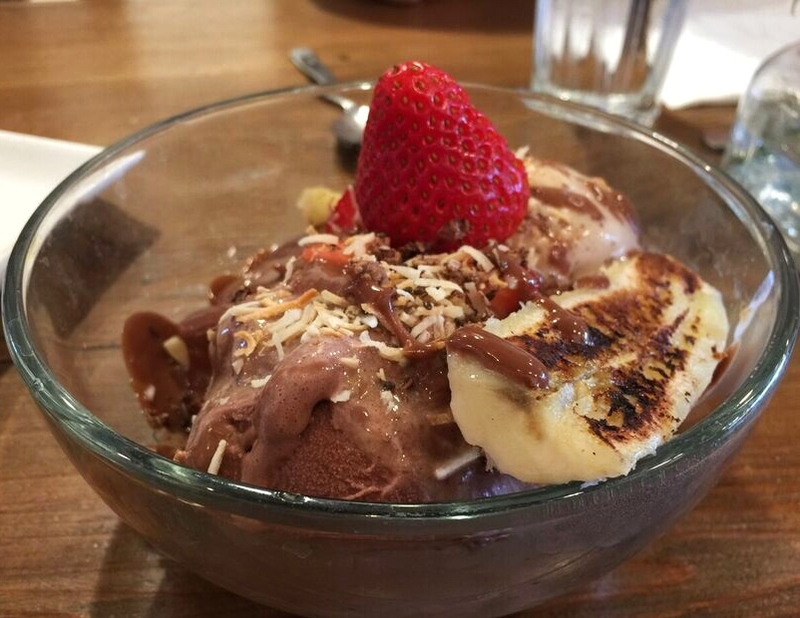 The base was locally made almond milk ice cream, and it was topped with caramelized banana, coconut, and chocolate syrup. Despite being entirely vegan, and loaded with vegetables and plant protein, this meal felt indulgent to me. I over-ordered, had double dessert, and took a few more bites of every dish than I should have. But, that’s the beauty of choosing food (and restaurants) wisely. It can feel good and actually be good for you too. I guess that means even vegans can splurge when they’re in Vegas, baby. 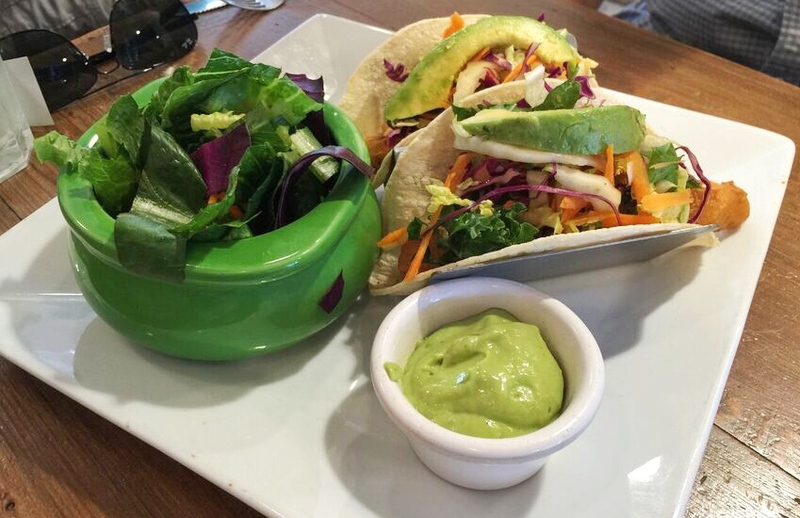 Where else in Vegas can you find moderately healthy eats? Any suggestions for my next trip? Wow!! What a delicious–and deliciously described–buncha food!! Not sure which dessert I would pick…I’d probably have to try both. 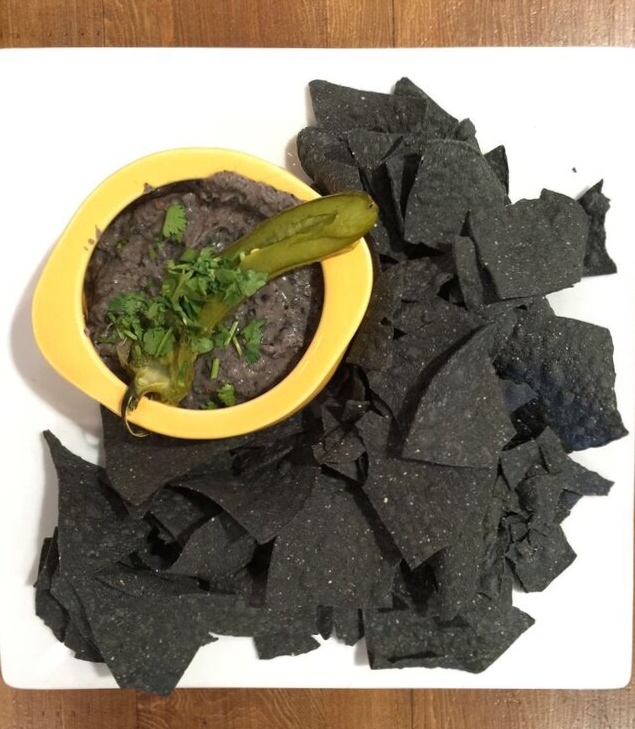 And the black bean hummus–maybe someone could reproduce that for her blog? ???? 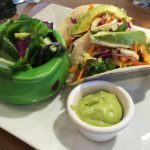 Once again, my clever friend wrote a most enjoyable and descriptive blog with great photos about the delicious looking food she & family clearly enjoyed at Vegenation. The photos of the desserts especially made my mouth water since I love blueberries & chocolate! I am always puzzled when vegan or vegetarian restaurants use “fish” or “chicken” in their menu instead of just listing what plant based ingredients they use. Perhaps they want to encourage meat eaters who are curious about eating at a vegan or vegetarian restaurant. No matter, I wish we had a good vegan restaurant in our lovely hometown. ?? Hello Miss Sheena! Thanks for reading the post and sharing your thoughts. I agree…a vegan spot locally would be fantastic. Maybe we should be the ones to start it. We found vegan pizza options at Slice of Vegas in Mandalay Place. 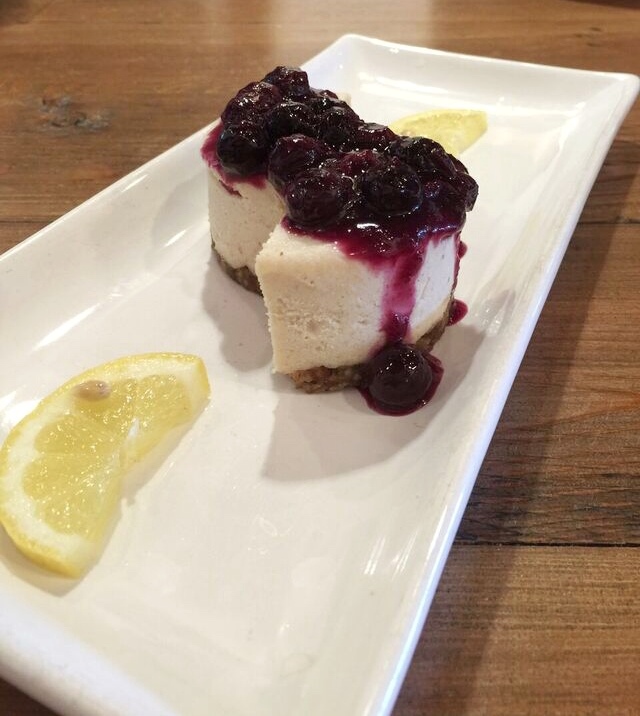 We also enjoyed Violette’s Vegan cuisine out west a short drive! We were right on Fremont Street and somehow we missed this place! What a shame, everything looks delicious! Hi Sharon. I’ll definitely check out Violette’s Vegan next time we go. You’d love Vegenation. It was amazing.